The Landmark compound on the east end of the Camce development combines high-end residential, hotel, restaurant and event spaces to create an exclusive, gated community. Landmark Diplomatic Residence offers luxury apartments for rent only, from $1,000 to $2,200 a month, said Neo Liang, a Chinese manager at Camce’s marketing office. Next door, offering unobstructed views of the Mekong River and Thailand on the other side, is the five-star Landmark Mekong Riverside Hotel, where President Barack Obama stayed in the presidential suite during his visit to Laos in 2016. Farther upstream, ASEM Villa features 50 fully furnished and decorated “mansion villas” for rent, starting at $4,500 a month. Mr. Liang said the gated community was more than 90 percent occupied, with a variety of tenants. “They’re from all over — Koreans, Japanese, Chinese, Singaporeans,” he said. A visit to ASEM Villa showed a strong presence by Chinese state-owned companies, including China Railway Group, which is building the rail line to Vientiane, and PowerChina, which has numerous projects of its own and via subsidiaries throughout Laos. Other offices with Chinese tenants included a Belt and Road information center and a Chinese culture center. The Singaporean ambassador’s residence and the European Union’s office for Laos are also there. The area includes another five-star hotel, the Don Chan Palace. At 14 floors, it is the country’s tallest. Like the Landmark compound, Don Chan Palace has a large banquet hall and convention center. On a recent visit, the lobbies of both hotels were primarily populated by Chinese businessmen. 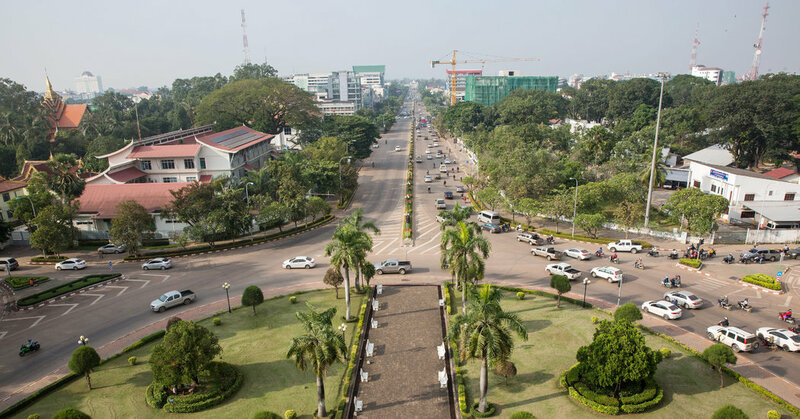 Vientiane New World, an outdoor mall on the development’s west end, is Camce’s most public-facing development. It features a small office building for the Chinese telecommunications giant Huawei — whose advertisements flutter on lampposts downtown — and a “walking street” with restaurants, cafes, shops and a beer garden. Chinese businesses are featured prominently at Vientiane New World, with regional Chinese restaurants offering cuisine from Liaoning and Shandong Provinces, as well as Old Chengdu, a high-end Sichuanese restaurant where several dishes cost upward of $100 — a month’s rent for the average Vientiane resident.